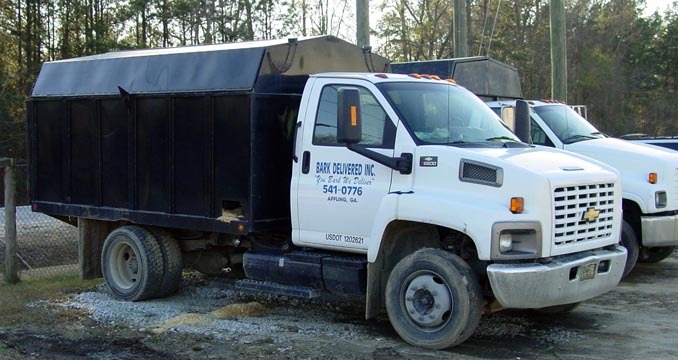 " You Bark, We Deliver "
We offer several types of wood mulch products including: Fine Pine Bark, Medium Pine Bark, Large Pine Bark, Dry Shavings, Green Sawdust, and Green Wood Chips to complement your yard, business, garden, or barn (for more information, please see our Products page). All of our products are delivered by one of our friendly drivers to the desired location in the CSRA by us at time most convenient to you (sorry, pick up service by the customer is not available), and longer distance delivery is available (please contact us for more information). A standard load is about 13 cubic yards. If you are interested in ordering one of our excellent pine mulch products or would like more information, please call us at (706) 541-0776 or send us an email any time. Our regular business hours are from 8am to 5:30pm Monday through Friday.